Maybe you remember this post about the steaming eye masks from Kao Megurizumu? I still love the masks but on the long run they turn out to pricey so I was looking for a cheaper alternative. 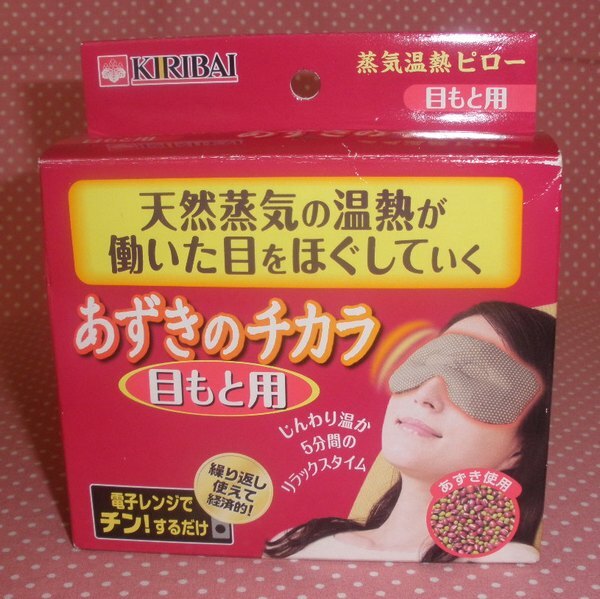 I got the Red Bean Steam Warming Eye Pillow from Kiribai on eBay for around US$15 and you can find it on Sasa for around $13. It´s an eye mask filled with red beans and can be heated in the microwave so it´s reusable. The beans have a light smell, like grain or dried beans of course. Not strong and not bothersome, natural and fine for my taste. The eye pillow is thick and a little heavy so it stays on the eye area nicely. 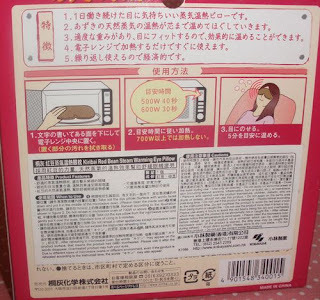 However there is nothing to attach this to the ears so you have to lie down on the back or the pillow will fall down. Microwave this mask with the words facing down (this is the side that´s not touching your eyes) for about 30 seconds on 600 Watt or 40 seconds on 500. If you see Japanese words appear on the lighter and softer side of the mask (the one you put onto your eyes) then the mask is too hot and shouldn´t be used until the words disappear. The pillow stays nicely warm for about 5-10 minutes, not as long as the Kao masks though! Still it´s a great replacement and great to use daily! Overall a great item and perfect to relax with this on at night or when my eyes feel tired during the day. I probably still prefer the Megurizumu masks but they are too pricey and uneconomical for daily use! This makes me want to have some red bean shaved ice, lol. I searched on ebay and couldn't find it. Could you tell me what to search for?